A mysterious figure by the name of Deacon Blackfire has a plan for Gotham City. Gathering the homeless and the distressed, Blackfire amasses an army to obliterate crime from the streets of Gotham. However, what good is a group of vigilantes if The Batman is still patrolling the streets? Blackfire captures The Dark Knight and by using a method of brainwashing, convinces The Caped Crusader that he is truly Gotham’s savoir. Are Blackfire’s intentions pure or does he have a hidden agenda? For the last few years, I’ve been trying to make my way through IGN’s 25 Greatest Batman graphic novels list. Other than a high listing, I knew very little. It wasn’t until I was a few dozen pages into the story that I realized Christopher Nolan had used this as the basis for The Dark Knight Rises. Replace Deacon Blackfire with Bane, make a few alterations and you’ve got the third act in Nolan’s Dark Knight trilogy. 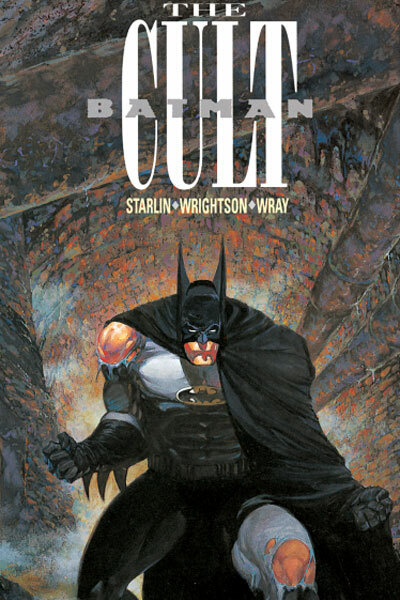 Released around the same time as Miller’s The Dark Knight Returns and Alan Moore’s The Killing Joke, The Cult mirrors their dark storytelling and subject matter. Gone were the days of Batman and Robin chasing The Joker over a giant piano, replaced by full panels of brutal violence and a general feelings of hopelessness for the citizens of Gotham. My only real problem with the story was the villain. The majority of Batman’s adversaries are somewhat based in reality (outside of Ra’s Al Ghul) and the character of Deacon Blackfire is seemingly immortal, achieving so by bathing in human blood. How exactly does this work? Kind of took me out of the story a little. At least with Nolan’s adaptation in replacing Blackfire with mercenary Bane, it’s a little easier to believe. Oh, and Robin is in it. Robin is a dork. September 11, 2013 in Comics, Fiction, Jim Starlin.